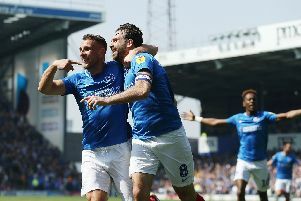 THE stage was the Checkatrade Trophy, the audience 1,520, yet a little piece of Pompey history was created. Last night Joe Hancott became the Blues’ youngest debutant at the age of 16 years and 161 days. That surpassed previous holder Gary O’Neil, who was 16 years and 256 days when he made his bow in January 2000 against Barnsley. Hailing from the Isle of Wight, Hancott is a first-year scholar and was thrown into first-team action to serve at left-back against Fulham under-21s. With Kenny Jackett opting not to risk Brandon Haunstrup, instead the Academy youngster was asked to feature for the entire 90 minutes. Hancott completed the Fratton Park match struggling with cramp as the scoreline finished 3-3 in the Checkatrade Trophy fixture. And afterwards Jackett praised the record-breaking left-back’s contribution. He said: ‘Joe has trained with us a little bit and we are short in that area, so when the chance comes the young players need to play. ‘We just needed a left-back and I didn’t want to risk Brandon. He’s only just come into the side and is our only left-back at the moment, so I wouldn’t want to lose him. ‘That was my reason for playing the young lad and giving him the chance. ‘We haven’t got enough balance down that side really and I wanted to see how Joe did and if we need to bring him on. ‘He started a little bit nervous, but showed he has a good attitude and a nice left foot. ‘He got cramp at the end but during the bit in the middle I felt did well and grew into the game. I was also pleased with how Kyle (Bennett) looked after him while injured. ‘Joe has impressed me and, at the moment, he is the next left-back in, that’s where we are, and we have to work with these young players and get them up to speed as we need them. Fulham’s youngsters had gone ahead on 21 minutes through Stephen Humphrys, but it was the second half in which the goals flowed. The hosts scored two goals in three minutes through Jamal Lowe and Kal Naismith to take the lead by the 57th minute. A George Williams penalty brought the Cottagers level, before the impressive Lowe grabbed a second. Then Elijah Adebayo secured the draw eight minutes from time, before the visitors won a penalty shoot-out to decide the destination of the bonus point. Jackett added: ‘Fulham started well and we didn’t get it right in the first half, but in the second half we looked like we could go on and win it. ‘I am disappointed with their second and third goals in a period where we were looking strong – and so disappointed to draw the game by the end.